When the Japanese capture the principal radio station of the American Radio Communications Company in the Philippines, the staff manages to escape into the jungle, tie up with a band of Filipino Scouts (Moros) and make their way to the coast. 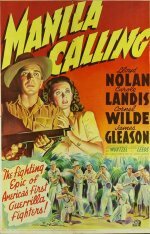 The party, radio technician Jeff Bailey (Cornel Wilde) and communications men Lucky Matthews (Lloyd Nolan) and Tom O'Rourke (James Gleason), finds an advance Japanese unit on the plantation of an old friend and, working with the Moros as a guerilla unit, attack and seize the site from the Japanese in order to use the radio transmitter. Solidifying themselves in the stronghold they discover there is no food or water and it is surrounded by the Japanese. A night club singer, Edna Fraser (Carole Landis), escaping from the Japanese, gets into the plantation. Jeff is working to fix their radio set, hoping to send a message of hope and courage to the conquered and enslaved Filipinos of the district, and the Japanese, aware of this possibility, are ... (Les Adams from imdb).